When we speak of heated competition in the computer world, we used to think of two pairs of rival camps: Intel and AMD, and then there were the nice memories of ATI and NVIDIA. After July 2006, it seems the maps have changed as AMD began to fight its still-ongoing two front war like Germany in World War II. Interestingly, this two front war came just at the right time after Germany took over the French capital. Those were the days when the Athlon 64 X2 was owning the Pentium D. Then they tried to blow its way against the east by spending $5.4 billion buying out ATI Technologies. Meanwhile, the other team were getting their acts together and the United States entered the war -- Intel brought in the Core 2 Duo that literally owned AMD in the enthusiast and consumer market. Two years later, Intel continued to floor the gas pedal -- and it's not a gas pedal in just any car -- continuing the cycle of price slashes, new stepping revisions, and lately the arrival of the Penryn 45nm CPUs. Well, here we are, with two vastly different CPUs sitting in our labs right now. Of which one is a so-called 'low end' dual core Wolfdale E7200 CPU (Like dang, I paid $200 for an E6300 back in 2006... this thing is low end? It's faster than an E6600) priced at $133 per 1000 units, and the second is the second best consumer processor from Intel -- the Core 2 Extreme QX9650 retailing for over $1000. Today, we'll look at the Intel Core 2 Duo E7200 Wolfdale CPU and see how much bang you can get for the buck. Our Intel processor review units came in a UPS medium box from Intel's California headquarters. Using UPS Express Saver, it's by no means slow, in fact it arrived in a day -- it's quite amazing. It's quite a big box; and with tons of paper and bubble packaging inside, our engineering sample CPUs arrived in perfect working condition. Time for the fun, baby. For us, small black boxes were used to hold these precious units, somewhat reminding me of jewelery. Except the one on the left is something a geek would really want -- look at the Sharpie label on top. We'll take a look at the QX9650 in a couple of weeks from now. Anyways, you'll probably be buying a retail box CPU anyway, so this is just to fuel your curiosity of what reviewers get! Notice that there are two stepping codes (SLAVN and SLAPC) for the Core 2 Duo E7200 according to Intel's website. 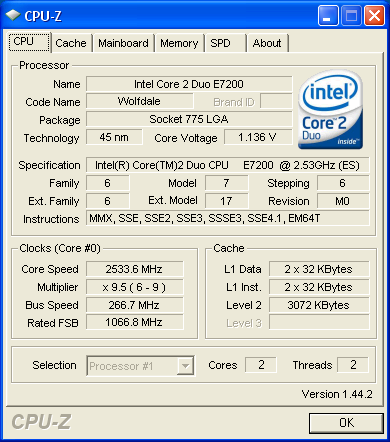 CPU-Z screenshot of the Intel Core 2 Duo E7200 processor. Initially, I did find the naming scheme a bit confusing because a T7200 is a Merom mobile CPU, haha. Just remember than the E prefix is always a dual core desktop processor. posted 5 hours and 4 minutes ago, with 9 posts. posted 5 hours and 5 minutes ago, with 3 posts.